Suitable for either home or light office shredding, the Aurora AS610C can shred up to 6 sheets of 75gsm paper at a time. The shredder shreds material into 4 x 47mm pieces, giving it a P-3 security rating. The Aurora AS610C will shred credit cards, paper clips and staples and features an 11 litre capacity bin with viewing slots so you can see how full it is getting. 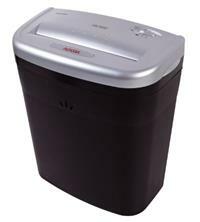 The waste bin is also easy to empty with a straightforward lift-off-top design and finger supports on the side. Other features include thermal cut-out to stop the shredder from over-heating, plus a sensor that prevents it from operating when the waste bin is removed. A simple three position switch includes Auto, Reverse and Off controls, making this a good all round and easy to use shredder.